Welcome to the Happiest Place on Earth! This package includes your 1-day Disneyland Park® admission ticket as well as round-trip transportation from select Los Angeles hotels. Come and meet Mickey, Minnie and all the gang as you ride some of the world's best rides! There’s so much to see at the Disneyland® Resort! Enter a magical kingdom where you can sail with pirates, explore exotic jungles, meet fairy-tale princesses, dive under the ocean and rocket through the stars - all in the same day! Opened in 1955, Walt Disney’s original theme park is divided into 8 extravagantly themed lands - Main Street, U.S.A., Tomorrowland, Fantasyland, Mickey's Toontown, Frontierland, Critter Country, New Orleans Square and Adventureland. Your day is one that will be filled with joy as you ride classic rides such as the Haunted Mansion and Pirates of the Caribbean or perhaps the newer attractions like Finding Nemo Submarine Voyage or the re-imagined Matterhorn. Don't forget to stop and meet Micky Mouse and his friends and be sure to finish your night with the Paint the Night Parade and the Disneyland Forever fireworks spectacular! 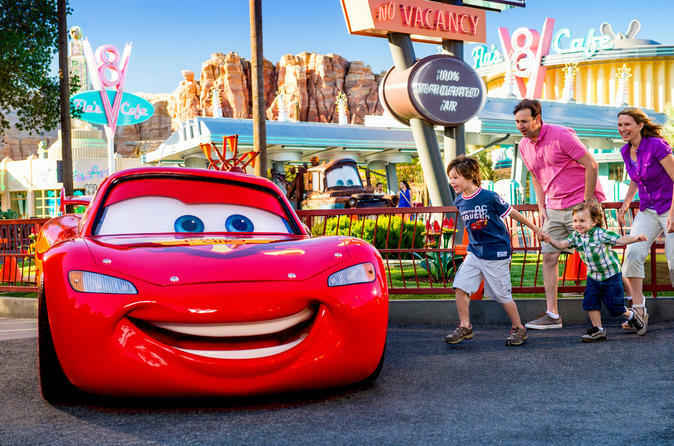 Choose to spend the day at either Disneyland or California Adventure or upgrade to a park hopper ticket and visit both parks!